Anesthetic safety is a top priority here at Regal Animal Hospital. There are certain checks we accomplish prior to using anesthesia to ensure they are safe and healthy enough for the procedure, whether routine or not. We use our lab equipment to do a blood test to find out if there could be any surgical complications, as well as concluding a CBC (complete blood count). There are many bodily system problems only detectable with blood sampling. Patient Ventilation (mechanical ventilator) is a means to provide respiratory support for animals having difficulty breathing. Ventilation is a critical component for pets that are suffering from any kind of lung complications. We are prepared to treat our patients in critical condition to provide them with the oxygenation they are struggling for. After the stitching is done, close monitoring is important for your pet to start making a speedy recovery. There are many monitoring systems that are important to oversee such as blood pressure monitoring (via Doppler), EKG, pulse oximetry, carbon dioxide, and temperature monitoring. On top the added health benefits of spaying or neutering your pet, it also regulates the behavior and prevents unwanted pregnancies. 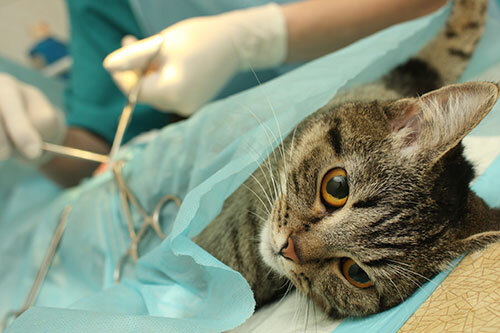 4-6 months is the recommended time frame in which to get a puppy or kitten spayed or neutered. Some of the health benefits include a reduced risk of cancer, less wandering, consistent behavior throughout the year, and less marking of territory! “Patient warming is now recognized as one of the most valuable enhancements used to help improve outcomes in patient care.” – Judith Rossi, Vice President of global communications for Smiths Medical of Norwell, Mass. Our furry patients have access to some warming devices to make them feel safe during any operation. Not only are there heating blankets that warm animals if they have gone cold, but also units that can maintain set temperatures during surgery. Contact us to see what we have!